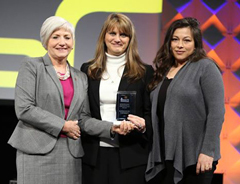 The college was presented with the American Association of Colleges for Teacher Education — Best Practice Award in Support of Global and International Teacher Education at the association's 67th annual meeting in Atlanta recently. Debbie Mercer, dean; Amanda Morales, assistant professor and diversity coordinator; and Tonnie Martinez, assistant professor, accepted the award. Morales drafted the five-page application with support from Kevin Murry, associate professor, detailing the college's many initiatives, which center on the concept that diversity is a collective responsibility that is woven into every aspect of the college's teacher education program. Morales wrote the college has "a history of recruiting and retaining diverse faculty, staff and students, offering undergraduate and graduate curriculum, providing intensive field experiences with diverse students for pre-/in-service teachers, and building community and school partnerships to support diversity, equity and global perspectives." • The Midwest Equity Assistance Center has been housed at K-State since 1978 and has provided vital services to wide a range of local and state constituents in a four-state region. • The Go Teacher program is an international partnership among the Center for Intercultural and Multilingual Advocacy, or CIMA, several other campus departments and the governing body of higher education in Ecuador. K-State is the lead institution in training 3,000 of Ecuador's ESL teachers. • CIMA's BESITOS program has become a model for bilingual/bicultural students in ESL education. The program recently celebrated its 15th anniversary. • The Center for Student and Professional Services has implemented a recruitment program with a research-based developmental advising model to address retention of first-generation college students and underrepresented students. • Preservice teachers are typically placed in one of three highly diverse schools districts that are members of the college's award-winning Professional Developmental Schools partnership. • The college began its fourth year of Project EXCELL, an acronym for Extending College Education for Lifelong Learning. It provides a collegiate opportunity for adults with mild developmental disabilities for supplemental transition services. Student volunteers assist with classes. • The college's Military/Veteran Educational Initiative began in 2012 with the purpose of preparing educators to serve military personnel, veterans and their families in educational settings. • The college has produced a diversity-themed documentary series "A Walk in My Shoes" and topics include international graduate students, first-generation college students and military life. Many other diversity-related films and videos are on the college's YouTube channel. • The college has established a diversity task force, diversity for community committee, diversity brown bag sessions, a multicultural inquiry group and a distinguished research lecture series that featured Gloria Ladson Billings, an American pedagogical theorist and teacher educator, as the inaugural speaker.